Known as the largest aviation museum in New England, the New England Air Museum is located in Windsor Lock, Connecticut. 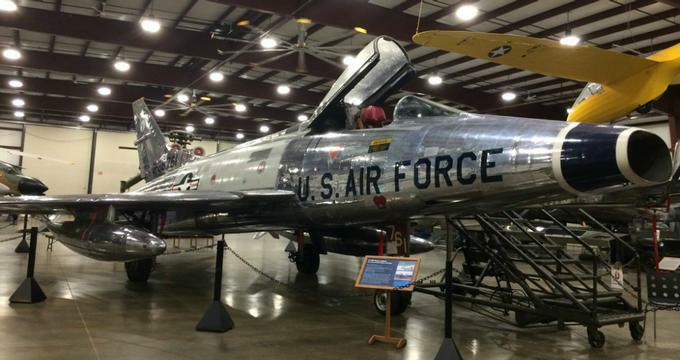 The museum aims to educate the public about the history and impact of aviation in America. Here, visitors can see engaging high-quality exhibits that demonstrate aviation technology and preserve the stories of the people who provided major contributions to the field of aviation. With more than 80 aircraft, instruments, engines, and personal memorabilia, the New England Air Museum provides a thorough overview of the history of aviation in America. As necessity is usually the mother of invention, WWII saw many innovations in the field of aviation. The B-29 Superfortress used by the 58th Bomb Wing in the Pacific theatre of the war is largely credited with the defeat of the Japanese Empire by August 1945. The effort of the brave men instrumental in carrying out the many dangerous missions as part of this effort are commemorated in the museum’s 58th Bomb Wing Memorial. Visitors to the memorial can see the ongoing restoration of Jack’s Hack, an example of the plane that made was instrumental in bringing down the Axis forces in WW2. Visitors curious about the early days of aviation will enjoy inspecting the museum’s replica of a Chanute-Herring Glider, which was originally constructed in 1896. Designed by Octave Chanute, a civil engineer, this model was designed similar to a bridge, giving it reasonable stability for its time. Though fragile by today’s standards, its lightweight yet rigid structure allowed it to achieve 14 seconds of flight, covering distances of up to 359 feet. Many would be surprised to learn that the structure was originally designed to be a tri-plane. The lowest tier of wings was removed after early test flights proved them unnecessary. The pioneering design of this craft became the basis of future generations of bi-planes, including planes used by the Wright brothers. Flown extensively in the spring of 1918 during the height of WWI, the Fokker Dr.1 is an example of an aircraft that captured the American collective imagination in a way few planes before it or since have. Its notoriety came from the fact that it was flown by Manfred von Richthofen, the "Red Baron”. Today visitors can see a replica of this model with their own eyes at the New England Air Museum. This Vietnam era plane was originally constructed in Canada by de Havilland Canadian in 1962. Seen as a workhorse for the army, the Caribou could carry up to 20 patient litters, four tons or cargo or vehicles, and 32 fully equipped combat troops. True to its design as a short takeoff and landing airplane, or STOL for short, it provided close support in battle areas. This aircraft was considered both rugged and reliable for its ability to operate on unimproved surfaces of fewer than 1,000 feet. Visitors will see its back doors, which made it easy for the plane to load and unload cargo quickly. This feature also allowed the plane to dispatch paratroopers in a timely fashion. Built in 1953, the Doman helicopter on display at the New England Air Museum demonstrates the innovations for which the company was known. The design of the aircraft allowed the engine to cool by way of the exhaust ejectors rather than the fan, which permitted it to increase its payload by approximately 800 pounds. Though hidden from view, this helicopter has a 400 hp. supercharged Lycoming engine. Its sealed, rigid, and hingeless rotor system is characteristic of many Doman designs. This piece was produced in consultation with army pilots, who tested its prototype and provided much needed feedback to the aircraft designers. Both adults and children are sure to find plenty to do, see, and experience when touring the New England Air Museum. For an more in-depth look at the responsibilities and thrills of life as a pilot, visitors can explore the Grumman E-1B Tracer Cockpit, where they get an inside look at the cockpit controls of this U.S. Navy reconnaissance aircraft. In addition, children aged 7 and up will relish a ride in the Ercoupe Full-Motion Simulator, which is a full motion flight simulator built from a real airplane that has been modified. Complete with ailerons, elevators, and rudder controls, it is bound to provide an exciting voyage for budding minds.